1984's Gremlins spawned a number of low-budget knockoffs with one-word plural titles such as Ghoulies, Critters and Munchies, all about little mischievous creatures wreaking havoc. 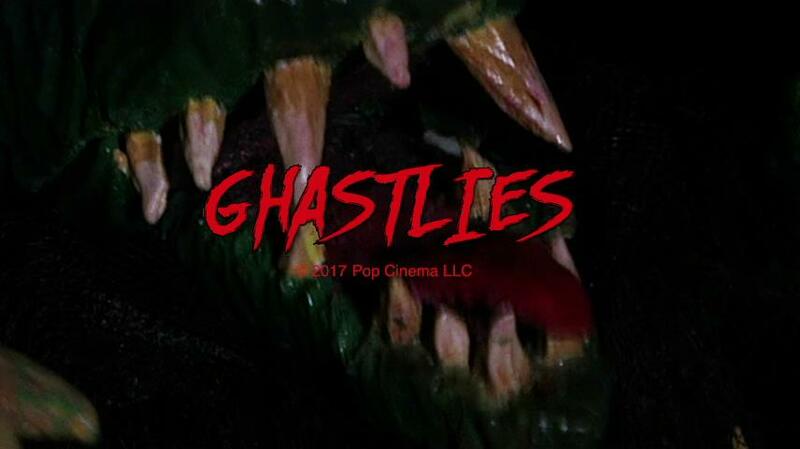 Ghastlies is an obvious homage to those movies, even throwing in bits of 1980s flavor such as day-glo fashions and an electronic music score. After a short prologue with a cult that doesn't make a lot of sense, we meet the four main characters, a group of sorority sisters (Kim Valentine, Jessica Huether, Kendra Summerfield and Julie Mainville) one of which is a new pledge. The other three take her out for a weekend at a rented cabin in the woods, as part of a "tradition" where she'll be initiated. One of their boyfriends (Joel Elliot, who happens to be Kim Valentine's real-life husband) and his friend soon crash the gathering, hoping to witness the girls holding a pillow fight in their underwear but that never comes to pass- instead, a trio of small alien monsters come out of the woods near the movie's half-way point and attack the characters with rather gruesome results. There isn't much else to say about the plot, except that there's also a lost pizza delivery guy in the woods, two inept cops on bicycles who are the only hope of restoring safety, and a grumpy elderly couple a few houses away who are just annoyed at all the noise caused by the darn college kids. This is a microbudget production shot on video, but it seems like it was mostly made for fun more than with any ambitions of cinematic greatness. The "Ghastlies" themselves are simple foam puppets, whose only movements are accomplished by the hands of someone off-camera (to their credit none of the humans manipulating them show up onscreen, although the boom mike does appear in a couple non-crucial moments.) While the results are amusing and the movie runs a mercifully short 75 minutes including rather long opening and closing credits, it seems that a bit more could have been done with all of this. The characters are largely one-dimensional, although that may have been part of the joke- after all, they're just going to get eaten anyways so why put much effort into them? (The commentary track explains some of this, which I'll talk about below.) There have been plenty of other spoofs that managed to get in some true laugh-out-loud moments, but that simply doesn't happen with this one although its heart is in the right place. The most creative moment comes when one of the girls, who earlier utters the totally-80s expression "Gag me with a spoon!" actually has that wish granted by one of the monsters. Shot on hi-def video in 24 frames per second (a look I've never been a fan of), the Blu-Ray is nicely detailed perhaps a bit too much, showing off the fakeness of the monsters and the cheapness of some of the settings (the cabin looks pretty nice on the outside, but why do some of its rooms look unfinished?) The colors are very bright as well, contributing to the intended 80s feel. Overall the Blu-Ray shows off this small production in the best way possible, without even any obvious compression artifacts in the dark scenes. A regular DVD is also included, which looks adequate but an obvious downgrade in resolution, including some slight black side bars which aren't present on the Blu-Ray. The audio on both discs is in 2-channel standard Dolby Digital, and is about 99% mono. I was afraid that this might be another case where something was screwed up in the mastering process, but one scene where the girls go swimming produces some surprising splashes in the rear channels. The sound remains in the center channel otherwise, but that's apparently how it was intended. There's a couple moments where dialogue is hard to decipher, but quality is decent overall with a fun 80s-themed synth score. A commentary track with director Brett Kelly and actor Trevor Payer is included, which is one that just might be more entertaining than the movie itself. Most of the movie's awfulness is confirmed as being intentional, with Kelly describing most of the dialogue as "intentionally terrible". He says that the idea for this came about when he wondered who currently owned the rights to the Ghoulies franchise and thought about doing another sequel to that, but came up with this idea instead. He also says that the setting is meant to be "evocative" of the 1980s but not necessarily set in them, as the car the girls travel in is a more recent model. There's also a very short special effects segment with John Migliore, who is perhaps the unsung hero of this production as he not only created the monsters but also plays two parts onscreen and did a number of other odd jobs. Another short segment with composer Tomb Dragomir talks about the 80s-inspired music score, and there's a music video of his theme song for the movie which has lyrics a bit more substantial than the actual script. Finally the 22-second trailer for Ghastlies is included along with trailers for My Fair Zombie, Spyfall, Homicycle, Call Girl of Cthulu, Amityville: No Escape and Land Shark. I wasn't expecting a whole lot from this and wasn't let down- it's mainly a small production done more for fun than anything else. Still, I've seen other movies with ridiculous themes (such as Killer Klowns From Outer Space, which Kelly mentions this has been favorably compared to) that had unique concepts and storylines to go along with them, and it seems like a lot more could have been done here. Perhaps there'll be a sequel later where these creatures can show their true potential- as this stands it'll likely amuse those who understand the joke of no-budget movies but others might consider it a waste of time.